A school librarian may see young children every week, but the older students become, the less we see them, maybe only a few times a year. Fortunately, we have most of these students over a 3-5 year period, depending on whether we are an elementary, middle, or high school librarian. We can scaffold short lessons throughout the school year, so by the time students leave us, they’ve mastered what they need for their next stage of library use. The question is, how best to do that? I’m here to tell you: DON’T start with library curriculum—start with everyone else’s curriculum! School Librarians are masters at integrating Library Information Literacy Skills into any subject. To do that, we don’t need to know the depth of a subject as teachers do, but rather, we need to look at the breadth of subject curricula and determine when students are likely to benefit from a library lesson. I’ve written about my Library Lesson Matrix and how I use that visual organizer to plan when each subject area needs a Library Lesson and what Info-Lit skills students are likely to need. The next step is to develop the actual lesson plan. You’re thinking, “Wait, shouldn’t we collaborate with the teacher first?” Uh, NO. In my experience, teachers who are unfamiliar with librarian collaboration can’t envision how we might help them. But, they will consider a library visit when we bring them something concrete, a printed example of how we’ll enhance their classroom learning. So before approaching them, we need to build the Library Lesson Plan. Think back to your college courses: 60 minutes long, just 2 or 3 a day and each only 2-4 times per week—intervals of learning and study. Now think of your last education PD: two 3-hour sessions, a lengthy lunchtime, a few 10-15 minute breaks, and by the time it’s over we’re exhausted from a single day. These two contrasting incidents are within our own discipline with which we’re already familiar, yet we expect kids aged 5-18 to spend 7 hours a day, 5 days in a row, learning new information in 6 or 7 or 8 subjects with a 3-5 minute break and 30 minutes for lunch…and we wonder why they can’t pay attention and don’t remember all that wonderful stuff we tell them! If we want students to learn and remember, we need to make each lesson memorable. First, teach only the information or skill they need for the task at hand. Second, kids remember something they DO, so give them an activity that allows them to practice what they learn. Through my 25 years in classroom and library I’ve used many different lesson plan forms, depending on what the district specified, the principal wanted, the teachers used, or the library director liked. I tried all the “best” models for lesson planning, but they all had flaws when planning library lessons. The AASL Standards for the 21st Century Learner in Action has a lesson template (p.116) that inspired me to combine the best of other planners and create my own. I’ve written about my Library Lesson Planner but its complexity can be daunting compared to other lesson plan templates. Let me take you step-by-step through it so you’ll understand what each section does and why it’s important. & print it out so you can follow along! The top section of the Library Lesson Planner gives a summary of the classroom topic, why students will benefit from a library visit, and what the Library Lesson is about. We use our curriculum matrix to fill out this section, because we’ve already compacted into it the information from the subject area scope and sequence document. We know it’s important to start with the end in mind, answering the question, “What do we want students to understand and be able to do by the end of the lesson?” Begin with Subject Standards for the classroom lessons with which we’ll correlate our library lesson. (We can also add Technology Standards that apply to the lesson and/or the final product.) Using Subject Standards as the foundation of the library lesson shows the teacher that we are enhancing their subject material…plus it keeps us focused on integrating library skills into classroom learning. Next enter any National School Library Standards that are pertinent to the Subject and to our preliminary ideas for the lesson. Enter more than can be completed during the actual lesson, and as you work through this section, decide which are imperative and delete those that aren’t. From Subject and NSLS Standards, we derive the entries for each following field, incorporating at least one entry that addresses the Subject Standards, to connect what students are learning between library and classroom. Since each field builds upon the previous one, we refine the Library Lesson to those essentials of both Subject and Information Literacy that fulfill the purpose of the visit. From chosen Standards, construct 2 or 3 Long-Term Understandings; these are the “big ideas” we want students to remember and apply to future learning. From the understandings create 2 or 3 Key Questions that focus on the content needed to attain those understandings. From the questions generate the ‘answers’ that “Students will know” by the end of the lesson, that is, the specific content Objectives for both Subject and Info-Lit. 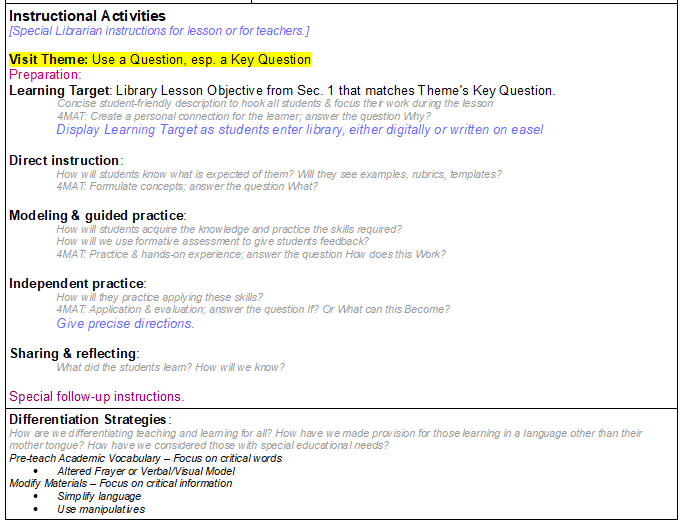 Finally, from Objectives choose the Critical Concepts and Vocabulary to emphasize during the lesson. These last two fields—objectives and concepts/vocabulary—help us build the teaching and learning activities in Section 3, but going through this process from Standards to Vocabulary ensures that the lesson is truly worthwhile. How will we know the Desired Results listed in Section 1 have been achieved unless we have some evidence? More specifically, we must give the teacher something on which to base a daily grade that demonstrates student learning. This section, more than any other part of the lesson plan, will convince a teacher to collaborate with us because they now have documented accountability for “deviating” from their own lesson plan. The Final Product and Product criteria may already be specified by subject curriculum or teacher’s lesson plan. That student product may indeed be a good one for the subject; however, it’s typically conceived by teachers who don’t have a background in Information Literacy (planning, problem-solving, research, resources, media and technology) that school librarians have. Therefore, we must conscientiously fill in this section to be sure the final product and its criteria are not only authentic but possible with our library resources. Performance Tasks—what “Students will be able to do”—must be specific and measurable. 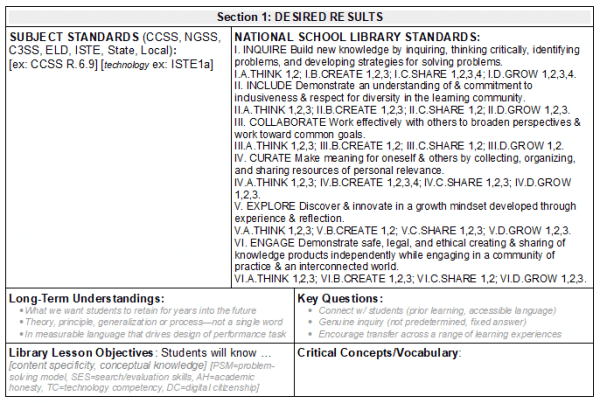 For this entry I still use Benchmarks from Standards for the 21st Century Learner in Action that relate to the NSLS chosen in Section 1. I may also include Behaviors from the Dispositions or Responsibilities Indicators. We can translate Technology Standards from Section 1 into Technology Integration criteria, and add that and our Info-Lit criteria to Product criteria—teachers appreciate seeing these written down to include in their rubrics and checklists. If it’s difficult to coordinate entries in this section, we need to reconsider what the teacher is expecting students to accomplish and suggest an alternative product. Because we use Subject Standards as the foundation for building our lesson, new product and performance task suggestions are more readily accepted by the teacher. While working through the preceding sections, we’ve begun to accumulate ideas for this section. (I enter mine as colorful italicized text) The top areas that list student resources and teaching aids, such as handouts, online sites, equipment, and examples, means we can quickly glance here the day before the visit to be sure we have everything ready when students arrive. Now we’re ready for Instructional Activities—exactly what we teach and what students do. I like to have a Theme for each library visit, related to a Key Question. Learning Targets and Differentiation Strategies are typical requirements in most schools/districts nowadays. A learning target is simply a student-friendly version of an objective from Section 1. Library visits are rarely contiguous, often days—or even weeks—apart, so each visit must cover a complete lesson cycle. The AASL Standards for the 21st Century Learner in Action template (p.116) is perfect for a library visit: Direct instruction, Modeling & guided practice, Independent practice, Sharing & reflecting. The prompts from other lesson planning tools such as UbD, UDL, and 4MAT help me formulate my lesson activities, and I delete the prompts after I’ve completed each part. If I have a slide presentation, I use its Notes to write the script so I only have to write ‘Slide#X’ on the lesson planner with follow-up actions to the slide. Because this lesson planner lends itself to single lesson or whole unit planning, we can use the Instructional Activities section for one or for multiple library visits. If I have multiple visits, I copy & paste a new Visit Theme-through-lesson cycle below the first, then add a number to each: Visit #1 Theme, Visit #2 Theme. After presenting a lesson we always think of ways to make it better, so a section to record problems encountered or suggestions for improvement means we won’t forget them when we prepare the lesson the following school year. This may seem like a lot of work for a single 40-50 minute lesson, but taking time for detailed planning—even more time than the actual lesson takes—makes a better lesson and makes us a better teacher-librarian. By starting with Subject Standards and going through each hierarchical step to the specific actions students will take, we enrich our original idea with more meaningful and authentic elements. A teacher will surely be impressed with our efforts, and once we’ve completed and refined the lesson, it’s useful for many years. Using the Library Lesson Planner, alongside the Library Lesson Matrix, for all our lessons can positively influence our entire school library program. 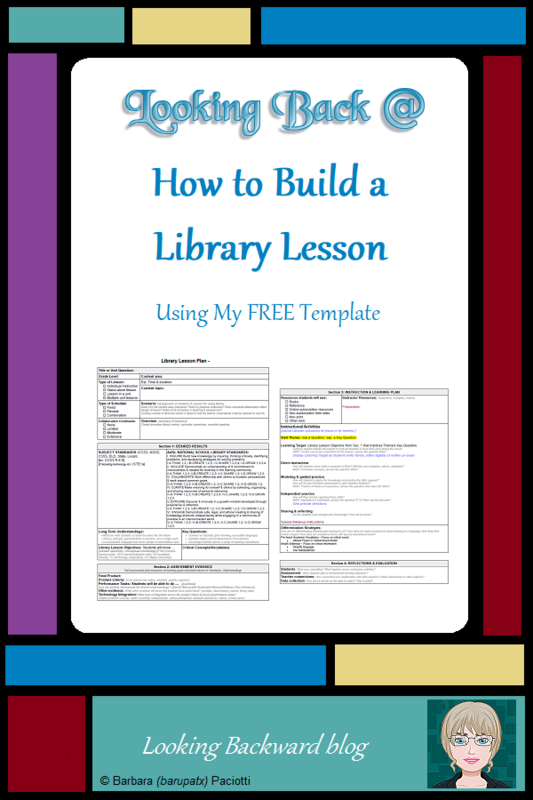 My Library Lesson Planner is also available as a MS docx from my Free Librarian Resources page. If you have questions about my Library Lesson Planner or how to use it, feel free to put them in the Comments below! School Librarians strive to create a student-friendly library. For me, this means minimizing the time it takes students to find what they need. Accordingly, I tell them to search the OPAC By Subject and the results will show them the Dewey number for the location of those books. There’s nothing more frustrating to a student—or to me—than getting a list with several widely different Dewey numbers. Every one of us, at some point, wonders why a book has a Dewey Decimal Number that places it in a certain location, yet another book on the same topic has a different Dewey number placing it in a different location—sometimes at opposite ends of the library! Should we change the number on one of them? Which one is “correct”? What if there are several books at both—or multiple—locations? Remember that the Dewey Decimal Classification System was designed to organize knowledge by discipline, that is, by the field of study of those who’d use the information. Library of Congress catalogers use that principle when they assign Dewey numbers for Cataloging-in-Publication (CIP) data, and usually it works fine in our school libraries. But, sometimes the Dewey number for adults working in a field isn’t compatible with the topical curricular needs of our PreK-12 students. Our young ones look for books by subject or topic, and they expect to find all of them together. I often change a Dewey number to put a book where students will look for it. 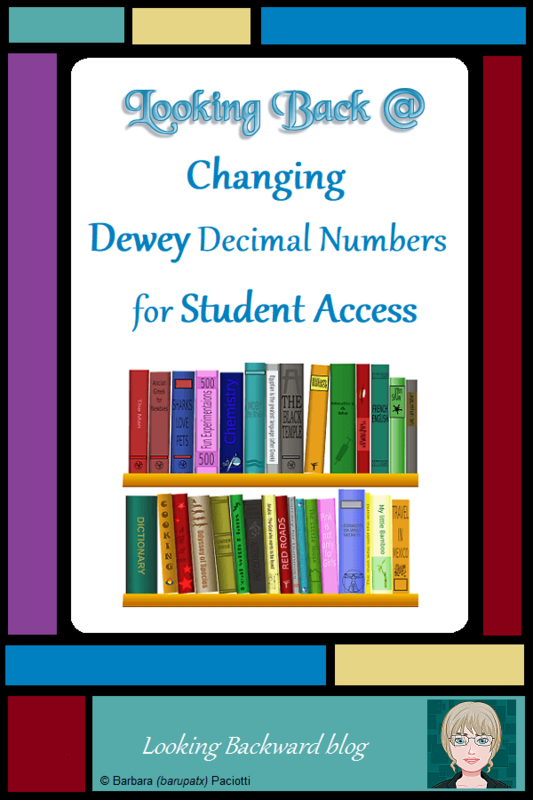 In fact, changing a Dewey number for student access actually fulfills the very purpose of Dewey Classification: “works that are used together to be found together.” For kids we can take some creative license and redo the numbers on books if they will be more useful in another location. Don’t worry about “the next librarian.” Who of us has memorized DDC numbers past the 10 main classes? The next librarian will be as concerned about student access as we are, and will be grateful that books are where everyone can more easily find them. Finding something in a different library? Who remembers the Dewey number of a particular book? A book search will tell them the location of any book in that library. So what if it’s different from ours as long as they can locate it. Even professional catalogers may disagree about where a book “belongs.” That’s straight from the cataloging professor when I took the course for my library degree! The most compelling argument for making changes is that LOC and OCLC continuously make changes to DDC to meet the changing needs of society. Each new publication of DDC and Abridged DDC has numerous pages of Dewey number additions, deletions, substitutions, and revisions that have been made since the previous publication. Sometimes they’ll change a whole section, like moving pets from the 500s to 600s or travel guides from the 600s to 900s. Dewey is meant to accommodate patron needs. For books with multiple subjects, DDC follows the rule of two or rule of three. This means books are assigned to the first, or lowest, Dewey Decimal Number that includes both/all disciplines. 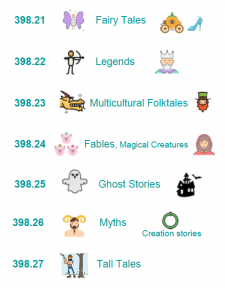 If you weren’t aware of this, it may explain why certain books are where they are…especially so many in the 300s! These 2 rules are particularly pertinent to computer books, typically found in 004 and 005. When students are looking for books about computers, they’re thinking of the manufactured physical product. So, if a book covers both informational software—the 000s—and computer hardware, I place it in 621.39 Computer engineering. That’s where students are more likely to look for it, and our computer books are checked out much more than they were in the 000s. Sometimes we can add additional decimals to a single section of books to make them more useful. Environmental books are often lumped into 333.7 and it’s difficult for students to differentiate them, yet adding one or two numbers to 333.7 Economics of land & energy for type of energy and 363.7 Problems with the environment for type can make it easier for students to discern what they need…and for me to pull books to a classroom cart for various ecology and environmental assignments. Other times we may need to change a book’s number to an entirely different Dewey class to make it more accessible. 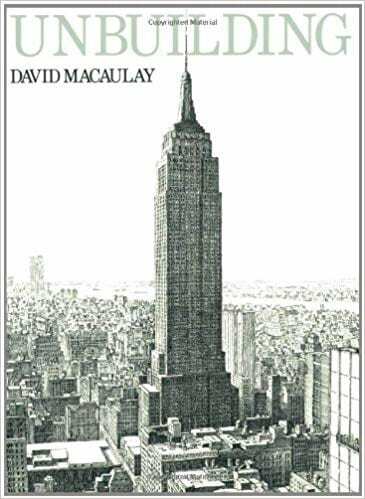 A librarian’s recent LM_NET post asked about David Macaulay’s book “Unbuilding,” a fictional dismantling of the Empire State Building, classified in 690, because she had 3 books on the actual construction of the Empire State Building in 974.71. I suggested she move the 3 ESB books to 690 Buildings. Historians (and perhaps NY students) would expect to find a significant event like ESB in the history of New York State, but who else would? My middle school library had books on buildings (including several by Macaulay) scattered in 300s, 600s, 700s, 900s, even 000s (about libraries!). I changed them all to 690 and within a few days the shelf was bare…boys saw them and couldn’t check them out fast enough! Similarly, books on science fair projects were numbered according to the type of science—chemistry, physics, earth science, biology—which made it nearly impossible for students to locate them. DDC actually has a specific number to class science fair projects: 507.8. I brought all the books together in 507.8 and ended up with 2 full shelves of books. Students—and teachers assigning projects—were much happier! 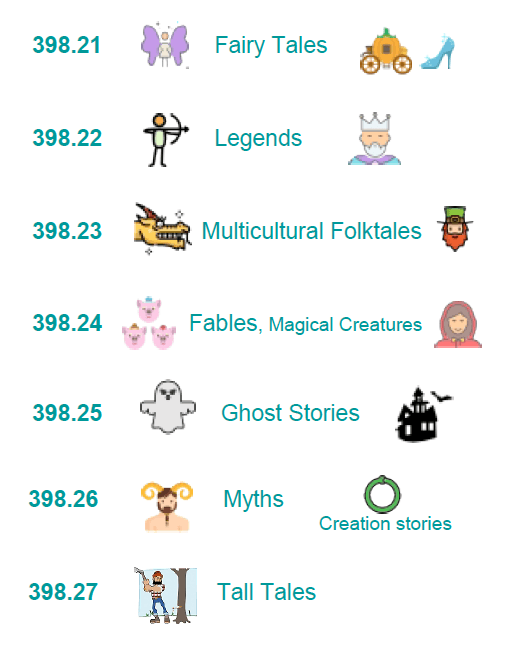 Multicultural tales I changed to 398.23 Places and times from 398.2089. That allowed me to reduce 2 decimal numbers then add one back indicating continent of origin according to Table 2 Geographic areas. Let’s face it, every library’s 920 Collected biographies are a mess. A spine label with 920 and the author’s 3 letters is not user-friendly for anyone, especially not for kids. Amazingly DDC offers an alternative called Option A, which uses numbers 921-928 to align with main Dewey Classes! I used them to completely redo my 920s. Students loved the change and circulation of those biographies dramatically increased! Drugs was such a problematic topic for my students because it appeared in 3 different Dewey numbers—362.29, 613.8, and 616.86—depending on whether the book is about drugs as a social problem, as personal health & safety, or as an addictive disease. To simplify access for students needing books about drugs, I decided to put all the books in 616.86. For similar drugs each of the original Dewey numbers had additional decimals that were wildly different. After careful analysis, I decided to adjust some of the thousandths numbers to create a more logical and consistent grouping of drugs for 616.86. Students immediately noticed the larger drug section, thought I’d purchased new books, and their circulation skyrocketed. LOC and OCLC have begun to make DDC culturally responsive, but more is needed. School Librarians must be especially responsive to the diversity of students we serve, so I’ve adjusted and even created numbers in some areas to overcome Dewey’s racial and cultural biases. I applied “Continent of origin” to books in 305.8 Groups of people, 398.23 Multicultural folktales, and 920 Collected biographies. My biggest change was gathering books together to create two completely new sections in 973 U.S. History: 973.04 Multicultural U.S. History and 973.08 Multicultural America about which I’ve written before. I’ve made other significant changes to 973 U.S. History by removing all the State books except our own, because a) it’s the only one our middle school students study, and b) because more accurate information about states is available online. I saved many relevant books found among the state Dewey numbers and changed them to other U.S. numbers, such as 973.091 for natural wonders & landmarks or the appropriate time period of U.S. history, or I moved them to a better Dewey section, such as putting books about 9-11 in 364.1 Criminal offenses where we have other terrorism books. You may be thinking, hey…this is way too much work! I admit, it takes some extra time up front, but just do a little bit at a time—not all of it at once. I typically pull out odd books while shelving, attach a stickie note with the new number, then make changes when I have a few minutes free at the circulation desk. For new books I may have to redo spine labels and cataloging for selected topics, but it doesn’t take that long. The greatest benefit is that it’s easier for students to locate like-topic books, which excites them. It’s faster for students to find the books they need, which pleases teachers who seem to think students waste time looking for things in the library. It increases circulation, which pleases our administrators who may think the library is just an add-on. If changing Dewey Decimal numbers changes people’s minds about our School Library Program, then I believe it is totally worth it! Even with Dewey number changes, the best way to help kids locate books is better library signage. 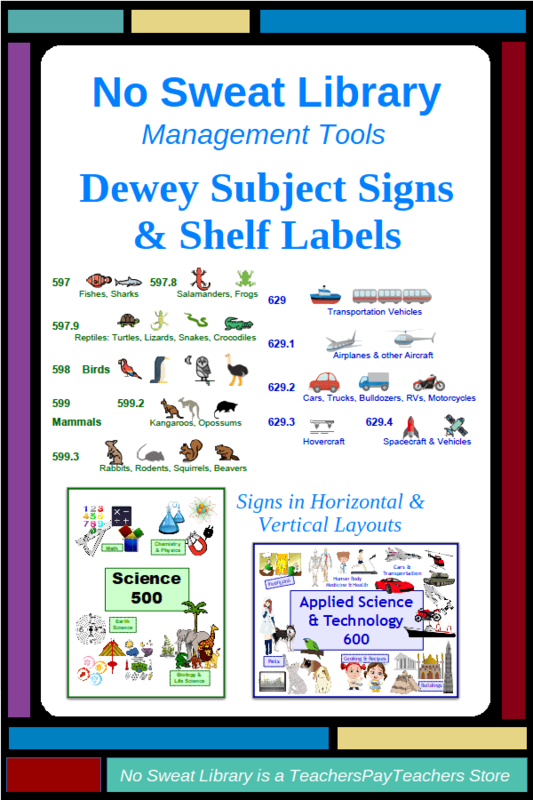 If you like the examples above of colorful text-and-picture labels I created for my Dewey shelves, you can get Dewey Subject Signs & Shelf Labels in my NoSweat Library Lessons store on TPT. Your students, like mine, will enjoy looking at your new signage and discovering topics within the library they hadn’t known about before! The real key to helping students locate books is teaching them how to locate a decimal number on the shelf. Teaching the DDC is a colossal waste of time. Work with your math teachers to create a phenomenal, hands-on lesson about place value and sequencing. To learn more about this, read my blog post Looking Back @ Teaching Dewey…or Don’t We? I hope this has convinced you to make changes to Dewey Decimal numbers on some of your books so they are more accessible for students. There are no “Dewey Police” that come into our library to check number assignments and lock us up for making Dewey changes, so let’s go ahead and DO IT! Our students will thank us, and that’s all the reason I need. When I began my School Librarian position, I didn’t have any bulletin boards and I didn’t care—I didn’t see the point in “cutesy” bulletin boards. Rather, I focused on decor for the rather bare 2-year-old library, installing purposeful posters and informational signage. One day I realized that folks had to decide to enter the library to see what it offered, but if I had bulletin boards I could entice students and teachers to make full use of everything the library had to offer. Now, Bulletin Boards are my primary way to promote the School Library to students, faculty, administration, and visitors! It doesn’t cost much because I don’t use prepackaged theme pieces; instead I create my own signage with slide presentation software that allows for a variety of text and graphics on 11″ x 8.5″ signs. I print them in color and laminate so they can be reused from year to year. For any bulletin board, what we display and how often we update depends on how many boards we have and where they are located. By designating certain bulletin boards for certain purposes, and carefully planning for long-term display, we can minimize the time needed to create and maintain them, yet still have them convey valuable and relevant information. Library Program Mission Statement – This sign typically stays the same for 2-3 years, and reflects my current Strategic Plan. My Professional Information Literacy Theme – I create a new Info-Lit theme when I rewrite my Strategic Plan. It’s my personal goal for focusing Library Lessons to integrate with classroom subject content and new technology. 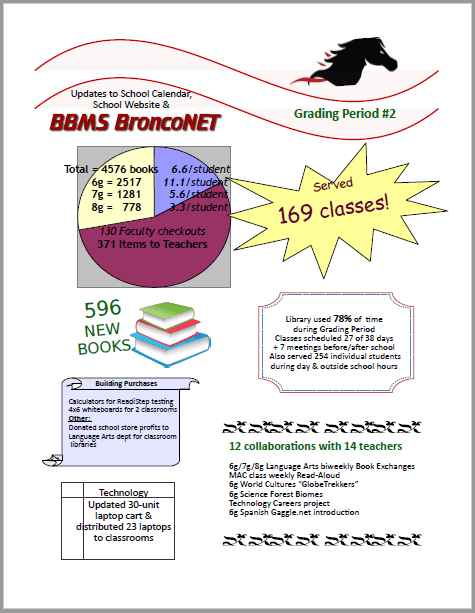 Library Activity Report – This is an infographic I create at the end of each 9-week grading period. I submit one copy to the principal and mount one on the bulletin board. Monthly Library Schedule – I simply print this out from online calendar the first day of each month. Anyone can see who’s scheduled for library use, and I can pencil in notes when planning with teachers. Public Library News & Events – Our school area includes 2 different city libraries and their Youth Librarians provide me with info and flyers, especially for the start of the school year and before each school break. A grade-level Information Literacy Theme sign that reflects my lesson focus for that grade at the top left corner. A grade-level English/Language Arts Unit Theme sign in the center. This sign changes for each 9-week grading period. A grade-level Social Studies Theme sign in the bottom right corner to promote their Special collections: “Read Around the World” for 6g, “Read Your Way through Texas History” for 7g, and “Read America” for 8g. I keep bookmark pockets filled with reading log bookmarks for this reading promotion program. I add smaller signs for other subject area classes that visit the library during the grading period, like infographics of online services for research projects. These change each grading period, too. Students can create a book review on a 3″x5″ index card and staple it on the board. It’s a great way to involve students and to update bulletin boards without a lot of extra work. Teachers really appreciate that I coordinate these bulletin boards with their subject content, and students constantly see them as they move between their classes. The 4th bulletin board is located in the hallway with 2 student bathrooms and is visible to nearly everyone on their way to the cafeteria. I share this 4′x4′ board with others so we can have a new theme for each month of the school year yet I don’t have to do it every month. September is decorated by our Spanish teachers and student Spanish Club for Hispanic Heritage Month, February is decorated by our Black History Month Committee (which includes students), and May‘s Asian/Pacific American Heritage Month is decorated by our ELL teacher and her students (we have a large Asian population in our school). All these groups use wonderful accessories to dress up and draw attention to the board and share classroom activities. I support that by displaying books inside the library that coordinate with each heritage, such as related biographies and authors. November is Native American Heritage Month, and I use the board for an Indigenous Peoples Around the World display to bring awareness of this issue and support our IB program. I create the display by continent and post signs with historical insights or quotations, along with pictures of book covers of our indigenous collection, including books by and about Native Americans. The March board is handled by the Fine Arts Department to feature Music in Schools Month and Youth in Art month. The April board is handled by the Math and Science teachers for Math Awareness Month and Earth Month, which includes highlights from our student Recycling Club. October is National Bullying Prevention Month and National Red Ribbon Week. Our school counselors—and student office aides—take on the bulletin board since they sponsor Red Ribbon Week and bullying also falls under their purview. December is a short month with our winter break, so I post coming activities at our public libraries to encourage students to visit the library and continue reading during the break. January is for our Internet Safety Month, during which all district librarians present lessons to our entire school. National Internet Safety Month is actually in June, but since we aren’t in school, our district has chosen January for these important lessons with the theme Be Safe in Cyberspace and Become a Digital Citizen. In addition to the board, student-created posters from my Library Lessons are displayed around the hallways. The monthly thematic bulletin board is also popular with teachers, especially those who otherwise don’t have a bulletin board on which to display their subject content classroom activities. Because students contribute to these displays, they are more meaningful to all students. 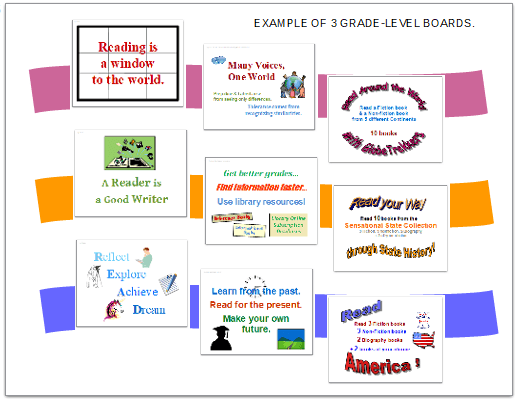 Join my mailing list if you want more information about these bulletin boards! 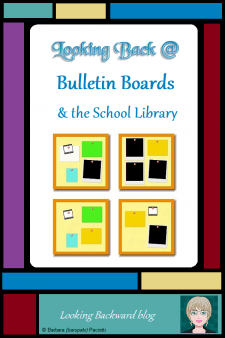 You can download my Purposeful Bulletin Boards ebook, which includes 15 Info-Lit and ELA signs. You’ll receive email notice of each new blog post covering all aspects of library lessons and management, and choose other free downloads from my e-List Library resources.